The yarn I used was a 5ply rather than the recommended 4ply, so I ended up making it extra small width-wise, and medium length-wise. There’s not actually an extra small listed in the pattern; I just made the smallest size, less one repeat. As with the cowl, I was fairly staunchly anti-shrug, but there are shrugs and there are shrugs. Lyttelton’s probably a bit longer than your average shrug, so lets just say it’s more of a bolero. I had some fairly well documented teething problems with the pattern, but this was due to my ineptitude rather than the pattern. I’m sure I’ve mentioned this before, but once again just for my sake, it helps a lot if you read the pattern. Once in the groove, I really enjoyed knitting it. One of the things that helped the enjoyment was cabling without a cable needle. If you haven’t tried it, I highly recommend taking a look at Grumperina’s tutorial. I think it saves time, and is a lot less fiddly. Lyttelton is the first Kate Davies pattern I’ve made, and I’ll be definitely making other designs from her in the future. 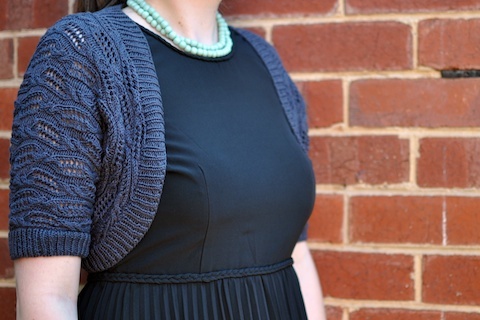 On a slight tangent, Kate’s latest cardigan pattern, Deco, is due for release in the next couple of days. Although I don’t have any suitable yarn for it in my stash, I’m really looking forward to its release. I’ll definitely be making one for myself. I bought this cotton when I was a uni student. I remember marvelling at it when it arrived in the mail, as it was probably the most expensive yarn I had bought up until that point. It was purchased specifically for the Lace Camisole, the cover pattern from Sarah Dallas’ Vintage Knits. However, before I cast on, I searched knitting blogs to find out how other knitters found the pattern (remember the days before Ravelry? yeah, it’s a bit hazy for me too). The reviews were not altogether positive, so the yarn languished in my stash. Lyttelton is probably better suited to a wool or a wool blend, but the grey cotton goes with a few things in my wardrobe, and I was keen to use the yarn up. As it turns out, I didn’t quite have enough yarn for Lyttelton. As the colourway had been discontinued years ago, I put out a call on Ravelry for scraps (before Ravelry, how did people find just that last little bit of yarn they needed to finish? I don’t know either). Luckily, someone very generously helped me out, and I was able to finish it. It’s nice to see yarn that’s been in my stash for so long transformed into a finished item. I should mention that much to my great annoyance, one of the balls I used had two knots in it. Usually I can handle the occasional knot, but two knots in just over 100 metres is quite frustrating. It was particularly frustrating because I knew I was running short so every centimetre of yarn counted, and I find weaving in ends of cotton yarn particularly tedious. As mentioned before, the colour was long discontinued so there was no point complaining to Rowan about it; I could whinge to myself and whinge to Matt, but ultimately I just had to put up with it. So far I’ve only worn Lyttelton long enough to have photos taken. Currently it sits in my wardrobe, waiting for a warm enough day to be worn. Maybe that day will be soon? Very classy – well done. The forecast predicts 24 degC for both Monday and Tuesday maybe that will be your chance? its just gorgeous, and when its warm i think all your little problems with it will fade into insignificance. its really stunning, lovely work! oh it looks very elegant in the photo – with a dress and beads and everything. Lovely. I’m a bit anti-shrug too – except for when I wear a shawl like a shrug. But I digress – so glad people came through with scraps. What a lovely way to finally use up some cotton you’ve had for ages! I don’t like that pre-rav time, it was a dark and dreadful time full of boxy cardigans and scratchy acrylic! No wonder nobody ever wanted me to knit them anything!